Corresponding authors. E-mail addresses: nyhe@seu.edu.cn (N. He), zfwang@seu.edu.cn (Z. Wang). The rapid development of nanomaterials provides an opportunity for overcoming the challenges confronted in biomedical fields including cancer therapy [1-3], drug delivery , and imaging  due to their unique property in structure and the capability of enhanced permeability and retention effect (EPR) [6-9]. 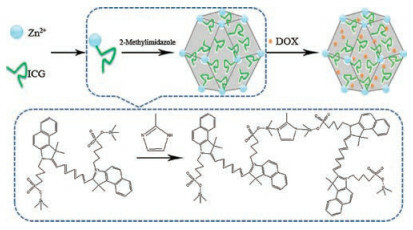 As an emerging porous nanomaterial, metal-organic frameworks (MOFs) composed of metal ions/clusters and organic bridging ligands have drawn growing attention from chemists and biologists in past decades in virtue of their tunable porosity, large specific surface area, and biodegradability, which can not only be used as drug delivery system (DDS), but also offer an chance to fabricate multifunctional nanomaterials via doping various metal ions and/ or functional molecules into the MOFs' structure . 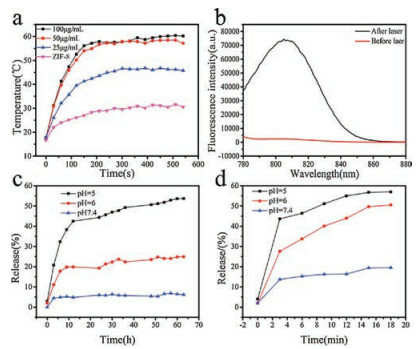 As an important subclass of MOFs, ZIF-8, built from 2-methylimidazole and zinc ions, possesses the excellent biocompatibility and high stability in aqueous solution . Therefore, how to fabricate ZIF-8 based therapeutic nanoplatform will be of special significance and should be encouraged in the development of ideal therapeutic agents. 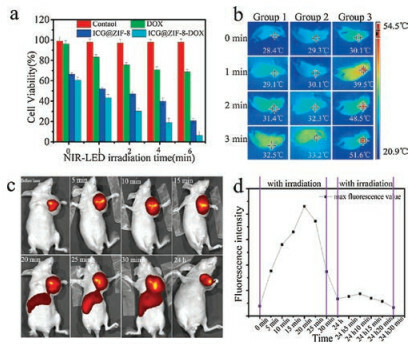 Photothermal therapy (PTT), which kills the targeted cells via the heat produced by absorbing light (often in near-infrared (NIR) wavelength), is becoming an effective cancer therapy and expected to be a supplement to traditional chemotherapy . To high efficiently convert optical irradiation into heat, various photothermal agents, including gold-based materials , carbon-based materials , and semiconducting materials , have been extensively studied. However, due to the biological incompatibility and toxicity, these inorganic nanomaterials are still far away from clinical application. Meanwhile, indocyanine green (ICG) with the absorption at round 800 nm has been widely used as the indicator substance in fluorescence angiography since its clinical application was approved by the United States Food and Drug Administration in 1959 . Recently, another ability of ICG to convert the absorbed energy to heat under the NIR laser irradiation has also been proved . However, when compared with PTT agents in nanoscale, the application of free ICG in PTT is usually limited by short residence time in the blood and lack of binding specificity. To address these issues, an effective approach is to encapsulate free ICG into nanocarriers. On the basis of the above consideration, herein, we present a one-step encapsulation of ICG in ZIF-8 NPs (ICG@ZIF-8 NPs) and further investigate the potential application of ICG@ZIF-8 NPs as the therapeutic nanoplatform by loading hydrophobic doxorubicin (DOX) which can act as a chemotherapy agent. 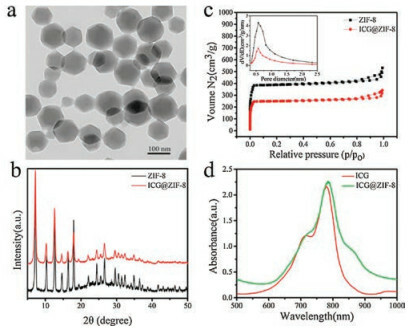 Unlike synthesis approaches widely adopted for molecule encapsulation in MOF-based material , the encapsulation of ICG and the synthesis of ZIF-8 are accomplished in one pot, which helps to improve the loading of ICG in ZIF-8. Upon the 808 nm laser irradiation, the temperature of the solution containing ICG@ZIF-8-DOX NPs can be heated to 55 ℃ in 5 min. At the same time, the release of ICG and DOX can be observed simultaneously. Therefore, it is expected that as-prepared ICG@ZIF-8-DOX NPs not only can be used for the synergistic chem-and photothermal cancer therapy but also can act as the optical imaging probe resulting from the release of ICG. The procedure for the one–step synthesis of ICG@ZIF-8 NPs is illustrated in Scheme 1. With the help of both the ionic interaction and the weak coordination between Zn2+ and sulfonic acid group of ICG, ICG and Zn2+ first self-assemble into a kind of ion-ligand complex. Upon the subsequent addition of the linkers 2- methylimidazole, these Zn2+ ion-ligand complex further form MOFs. During the formation of ZIF-8, ICG molecules can be thus encapsulated into ZIF-8. The loading of DOX into ICG@ZIF-8 NPs is carried out by simply mixing as-prepared ICG@ZIF-8 NPs with DOX (also called ICG@ZIF-8-DOX NPs later). Before studying their application, the structure of as-prepared ICG@ZIF-8 NPs was separately characterized by TEM, XRD and BET. From TEM image in Fig. 1a, it can be found that as-prepared ICG@ZIF-8 NPs have the average size of around 100 nm with cubic morphology, which looks like free ZIF-8 reported in literature . Fig. 1b further gives the XRD spectra of ICG@ZIF-8 NPs and free ZIF-8, respectively. The comparative analysis demonstrates that the incorporation of ICG into ZIF-8 framework does not affect the crystalline nature of ICG@ZIF-8 NPs and there are still the strong diffraction peaks at the 2θ value between 5° and 20°, which are similar to those of pure ZIF-8. The nitrogen adsorption-desorption isotherms of ICG@ZIF-8 NPs and ZIF-8 NPs (Fig. 1c) uncover that the pore size of both ICG@ZIF-8 and ZIF-8 NPs are very close (about 0.62 nm). However, the surface area decreases from 1340 m2/g for ZIF-8 NPs to 474 m2/g for ICG@ZIF-8 NPs due to the incorporation of ICG. The successful incorporation of ICG into ZIF-8 NPs was also verified by UV–vis absorption spectra. As shown in Fig. 1d, ICG@ZIF-8 NPs have the broad absorption between 650 nm to 850 nm, which is similar to the absorption behavior of free ICG. Meanwhile, the maximum absorption peak of ICG has shifted from 780 nm to 783 nm after being embedded in ZIF-8 NPs, which might be related to the weak interaction between Zn2+ and ICG. In addition, according to the change in ICG concentration before and after being embedded in ZIF-8, the amount of embedded ICG is about 8.7 wt%. So it can be concluded that we have successfully prepared ICG@ZIF-8 NPs with the maximum absorption peak centered at 783 nm via the one–step approach. Scheme 1. Schematic illustration of the synthetic procedure for ICG@ZIF-8-DOX NPs. Fig. 1. (a) TEM image of ICG@ZIF-8 NPs; (b) XRD patterns of ZIF-8 NPs and ICG@ZIF- 8 NPs; (c) The nitrogen isothermal adsorption curves and pore size distribution of ZIF-8 (black line) and ICG@ZIF-8 (red line); (d) UV–vis spectra of ICG and ICG@ZIF-8 NPs. To examine the photothermal conversion ability of ICG@ZIF-8 NPs, the aqueous solutions containing different amounts of ICG@ZIF-8 NPs (25, 50, 100 μg/mL) were continuously irradiated using 808 nm laser (5 W/cm2), and the corresponding temperatures were measured with an infrared thermal camera. As shown in Fig. 2a, the concentration-dependent photothermal heating effect is observed. For the aqueous solution with 100 μg/mL of ICG@ZIF-8 NPs, its temperature increases from 18 ℃ to 55 ℃ in 300 s. By contrast, the aqueous solution containing pure ZIF-8 is just heated up to around 28 ℃. The above results clearly demonstrate that ICG@ZIF-8 NPs can be used as the PTT agent. Meanwhile, it is also found that after 808 nm laser irradiation for 300 s the aqueous solution containing ICG@ZIF-8 NPs will emit the strong fluorescence when excited at 780 nm (Fig. 2b), indicating that ICG embedded in ICG@ZIF-8 NPs is released during this procedure. On the contrary, no fluorescence is observed for ICG@ZIF-8 solution without the laser irradiation. On the basis of the above results, we can speculate that for ICG embedded in ICG@ZIF-8 NPs the phenomenon of "aggregation-caused quenching" occurs and the absorption energy is converted to the heat instead of the fluorescence. That is why these ICG@ZIF-8 NPs have the good photothermal conversion ability. In addition, due to the weak interaction between Zn2+ and the embedded ICG in NPs, embedded ICG molecules will be disassociated and released into the solution when heated under the laser irradiation, which provides a chance for as-prepared ICG@ZIF-8 NPs to act as the optical imaging probe. Fig. 2. (a) Temperature elevation of ICG@ZIF-8 NPs aqueous solution with the different concentrations as a function of the irradiation time (808 nm laser, 5 W/cm2). (b) The corresponding fluorescence spectra before and after the laser irradiation. (c) Release of DOX from ICG@ZIF-8-DOX NPs measured at different pH values; (d) Release of DOX from ICG@ZIF-8 NPs at different pH when exposed to NIR laser irradiation. To evaluate ICG@ZIF-8 NPs' capability as DDS, DOX was loaded by mixing ICG@ZIF-8 NPs with DOX. Fig. S1 (Supporting information) illustrates the UV–vis spectra of the DOX solution before and after being adsorbed by ICG@ZIF-8 NPs. According to the change in absorption intensity at 480 nm, its loading efficiency is around 1.71 wt%. The release behavior of DOX from ICG@ZIF-8-DOX NPs under different conditions is further demonstrated in Figs. 2c and d. From Fig. 2c, the pH-responsive release of DOX is first observed. For ICG@ZIF-8-DOX NPs kept in aqueous solution with pH 7.4, only a small quantity of DOX is released even after 60 h incubation, which is similar to the results reported on other ZIF-8 NPs based DDS . However, nearly 53.7% and 24.9% of loaded DOX have been released in 60 h when the pH value of aqueous solution reaches 5.0 and 6.0, respectively. These results are possibly related to the electrostatic interaction between DOX and ZIF-8. Under the acidic condition, such electrostatic interaction is weakened, further resulting in the release of DOX. Fig. 2d also gives the cumulative release of DOX under the irradiation of 808 nm laser. It can be found that the irradiation of 808 nm laser obviously accelerates the release of DOX when compared with ICG@ZIF-8- DOX NPs without the irradiation. For instance, at pH 5.0, 57% of DOX can be released in 18 min. Therefore, the laser irradiation on ICG@ZIF-8-DOX NPs not only leads to the increase in temperature but also tremendously accelerates the release of DOX, which will favor the synergistic chem-and photothermal cancer therapy. The cytotoxicity of pure ICG@ZIF-8 NPs, ICG@ZIF-8-DOX NPs or free DOX on normal cells (L929) was comparatively evaluated by the MTT assay. As shown in Fig. S2 (Supporting information), for ICG@ZIF-8 NPs, the cell viability is above 75% in the concentration of 0–125 μg/mL, demonstrating that ICG@ZIF-8 NPs have the low cytotoxicity under the concentration of 125 μg/mL. After the adsorption of DOX, the obvious dose-dependent decrease of the cell viability is observed for resulting ICG@ZIF-8-DOX NPs. And the cell viability decreases to 26% when its concentration reaches 5 μg/mL. As a contrast, the cytotoxicity of free DOX with the same amount as adsorbed DOX in ICG@ZIF-8-DOX NPs was also tested. It can be found that the viability of cells treated with ICG@ZIF-8-DOX NPs is lower than that of cells treated with free DOX under the equivalent content of DOX, which is consistent with our previous results reported on CuS@ZIF-8-DOX NPs . The higher toxicity of ICG@ZIF-8-DOX NPs might come from the synergistic effect of ZIF-8 and DOX. To investigate the application of as-synthesized ICG@ZIF-8-DOX NPs in chemo-photothermal treatment, we first used MCF-7 cells as in vitro model and studied their viability after incubation with ICG@ZIF-8-DOX NPs, followed by the 808 nm laser irradiation. Fig. S3 (Supporting information) gives the confocal microscopic images of MCF-7 cells obtained in Calcein-AM/Propidium iodide double staining assay. The green fluorescence comes from calcein dye in live cells, which is generated by the hydrolysis of CalceinAM, and the red fluorescence comes from propidium iodide, representing the information from dead cells. For MCF-7 cells without any treatment with DOX or NPs, all cells are healthy and 6 min-laser irradiation is not harmful to them. However, for MCF-7 cells treated with ICG@ZIF-8 NPs, part of cells has been already dead just upon 3 min irradiation. Meanwhile, more dead cells are observed in the group with the treatment of ICG@ZIF-8-DOX NPs. When the irradiation time reaches 6 min, all cells in the group with the treatment of ICG@ZIF-8-DOX NPs are dead, but few cells still live in the group with the treatment of ICG@ZIF-8 NPs. The similar results are also quantitatively obtained by MTT assay, as shown in Fig. 3a. Upon 6 min irradiation, the viability of MCF-7 cells decreases to 20% for ICG@ZIF-8 and 5% for ICG@ZIF-8-DOX NPs, respectively, when compared with 100% for the negative control. Additionally, in another control group, where MCF-7 cells are just incubated with free DOX, the cell viability decrease to 70%. It can be concluded that the thermal damage is the leading cause of the cell death, which can be contributed to the good photothermal conversion ability of embedded ICG in ICG@ZIF-8 NPs. 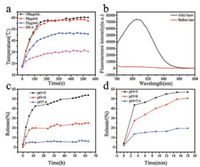 Meanwhile, the effect of adsorbed DOX on the death of cells, namely the chemotherapy, can be obviously observed in the light of the cell viability difference between ICG@ZIF-8 and ICG@ZIF-8-DOX NPs. Therefore, as-prepared NPs can be used for chemo- and photothermic synergistic therapy. Fig. 3. (a) Cell viability of MCF-7 cells treated with saline as a control, ICG@ZIF-8, free DOX or ICG@ZIF-8-DOX for 12 h, and then exposed to 808 nm NIR laser for 0, 1, 2, 4 and 6 min. (b) Photothermal images of tumor in the mice injected with saline (control, group 1), free DOX (group 2), or ICG@ZIF-8-DOX NPs (group 3) upon 1, 2 or 3 min irradiation. (c) Fluorescence images of mice with the administration of ICG@ZIF-8 NPs upon the 808 nm laser irradiation for the different time. (d) The corresponding fluorescence intensities. The in vivo therapeutic efficacy of ICG@ZIF-8-DOX NPs was further evaluated on the breast cancer-bearing mice. In the experiment, the mice have been divided into three groups and intratumorally injected with three kinds of solutions: (1) saline, (2) containing free DOX and (3) containing ICG@ZIF-8-DOX NPs, respectively. One hour later, all tumors were exposed to an 808 nm laser for 3 min. As shown in Fig. 3b, the temperature of tumor in group 3 quickly increases from 29.7 ℃ to 52.7 ℃, which is high enough to induce cell death. In other two groups, the temperature just increases to around 33 ℃. 3 min laser irradiation on tumor was repeatedly carried out once a day until the 9th day. Fig. S4 (Supporting information) gives the photos of mice taken at 1st, 3rd, 5th, 7th and 9th day. It can be found that in group 3 with the administration of ICG@ZIF-8-DOX NPs, necrosis appears on the 3rd day and the tumor begins to shrink. On the 9th day, black scar is left on the site of tumor. By contrast, in group 2, the injection of free DOX alone does not obviously change tumor development, which might result from the small dosage of injected DOX. These results confirm that ICG@ZIF-8-DOX NPs is an effective PTT agent. As mentioned above, ICG embedded in ICG@ZIF-8-DOX NPs will be released upon the 808 nm laser irradiation, which can be used to trace the release behavior of NPs in tumor. Herein, we further used the Maestro all-optical imaging system to observe the real-time change on the fluorescence intensity around the tumors under the laser irradiation. Figs. 3c and d respectively give the images of mice and the corresponding fluorescence intensities. It can be found that before the irradiation the fluorescence of ICG in the tumor region is very weak, which is consistent with the previous result that embedded ICG has no fluorescence due to the "aggregation-caused quenching" effect. 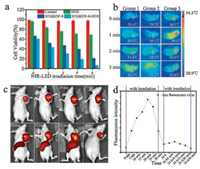 However, with the increase in the irradiation time, the fluorescence intensity in the whole tumor region gradually increases and reaches the maximum after 20 min irradiation, clearly exhibiting the in vivo release of embedded ICG. When the irradiation time reaches 20 min, the released ICG even diffuses from the tumor to the other body regions via the interstitial fluid and blood and is finally captured by the reticuloendothelial system. As shown in Fig. 3c, the fluorescent area in the abdomen of mouse gets bigger and bigger during 20–30 min irradiation, resulting from the release of more ICG. Twenty-four hours later, the optical image of mouse was taken again. We find that the fluorescence signal from the abdomen of mouse has already disappeared and only the fluorescence from the tumor region can be detected, whereas their intensity becomes weak. This result illustrates that the released ICG has been metabolized and excreted out of the body. Meanwhile, if the similar irradiation was conducted in the second day again, no obvious increase in the fluorescence intensity was observed, indicating that the amount of ICG released from ICG@ZIF-8-DOX NPs has decreased. This phenomenon can be understandable considering the fact that the amount of residue ICG in ICG@ZIF-8- DOX NPs become less and the interaction between residue ICG and ZIF-8 NPs turn stronger. In conclusion, the above results demonstrate that the incorporation of ICG in ZIF-8 NPs can help to trace the release or degradability behavior of NPs in tumor in future. To summary, in this work, we present a one-step process for the encapsulation of ICG in ZIF-8 NPs and further study their potential application in the therapeutic nanoplatform. The results show that the incorporation of ICG does not affect the crystalline nature of ZIF-8 and as-prepared ICG@ZIF-8 NPs with 8.7 wt% loading of ICG have the maximum absorption peak centered at 783 nm. Upon the 808 nm laser irradiation, its temperature increases from 18 ℃ to 55 ℃ in 300 s when the concentration is 100 μg/mL. After the adsorption of DOX, the resulting ICG@ZIF-8-DOX NPs perform the chemo- and photothermic synergistic therapy for tumor. In addition, due to the weak interaction between Zn2+ and the embedded ICG in NPs, ICG molecules can be disassociated and released into the solution when irradiated with the 808 nm laser. In the mice model, the released ICG diffuses from the tumor to the other body regions via the interstitial fluid and blood and is finally captured by the reticuloendothelial system. Therefore, as-prepared ICG@ZIF-8 NPs can also be used as the optical imaging probe to trace the degradability behavior of NPs in future. This study was financially supported by the State Key Basic Research Program of the PRC (No. 2014CB744501), the NSF of China (No. 81771976), Fundamental Research Funds for the Central Universities, and the joint fund of Southeast University and Nanjing Medical University. Supplementary data associated with this article can be found, in the online version, at https://doi.org/10.1016/j.cclet.2018.02.014. L.L. Guo, T. Wang, Z. Chen, et al., Chin. Chem. Lett. 11 (2017) 1-9. H.K. Moon, S.H. Lee, H.C. Choi, ACS Nano 11 (2009) 3707-3713. J. Dai, X. Xiao, S.X. Duan, et al., Chem. Eng. J. 331 (2017) 64-74.